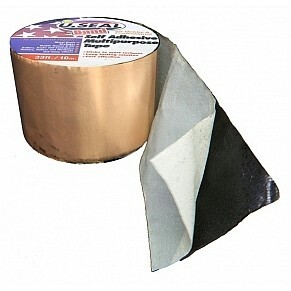 FEATURES: U.Seal roof flashing / waterproofing tape has a heavy solid copper sheet facing (requires no UV protection) together with an extra thick rubberized asphalt based adhesive system. The real COPPER sheet facing is very ductile and provides flexibilty for wrapping irregular shapes and surfaces. Overall the tape is 60 mils thick -- more than double that of most others. OPTIONS: Available in widths: 2, 4, 6, 9 and 12" wide, and also in faced with white color aluminum, terra cotta aluminum, and embossed aluminum.